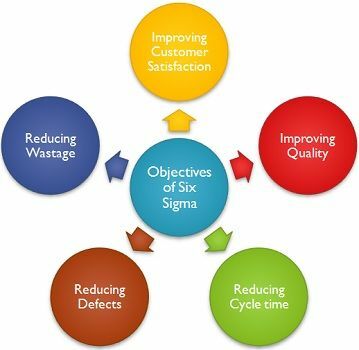 Definition: Six Sigma is defined as a management technique employed to maintain the desired quality in the organization’s processes and end products. It involves, taking planned and integrated steps, so as to enhance the quality of products and reducing cost. Six Sigma is a well-organized method of developing and providing, those products and services to the customers that are nearly perfect. The process aims at satisfying and improving goals of the firm, with respect to quality, cost, manpower, new products, and so forth. Here, efforts are continuously made to update the current standards and setting up higher ones. When represented statistically, six sigma explains the way process is performing. When in a process, the maximum number of defects per million should not more than 3.4, then only six sigma can be achieved. DMAIC: It is an improvement technique for current processes, products, and services whose specifications are not up to the mark and striving for incremental improvement. Define: Define the process improvement goals, which are in tandem with the organization’s strategy and the customer’s demands. Measure: Measure the current processes so as to make the comparison in future. Analyze: Data is analyzed, so as to verify the cause and effect relationship between the variables in the current processes. Improve: Based on the analyses, a detailed plan is made so as to make improvement in the current process using various techniques. Control: Pilot study and the intial trial are made to identify process capability. After that process is measured continuously, to ensure that process is free from defects and control deviations. 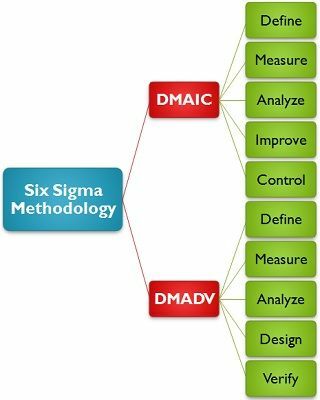 DMADV: It is an improvement methodology, for designing new processes, products, and services, with six sigma quality levels. Define: First of all, the goals of the process is determined, which should match the company’s strategy and customer’s needs. Measure: Next, identify the characteristics which are critical to quality (CTQ) and measure them such as product capability, process capability and the risk involved. Analyze: Design and develop, various alternatives and analyze them, so as to select the best out of them. Design: Design the best alternative, which suits the requirements. Verify: Verify the design by simulations or pilot runs and implement the process. Six Sigma is not only a quality initiative but a business initiative too, as it involves analyzing business processes to improve them. Theme 1 – Genuine focus on the customer: By implementing six sigma, the organization is able to learn more about their customers. Here, the top-most priority is given to the customers, and the improvements can be measured by their effect on customer satisfaction. Theme 2 – Data and fact-driven Management: Six Sigma is based on the concept of ‘management by fact’ as well as takes it to a higher level. 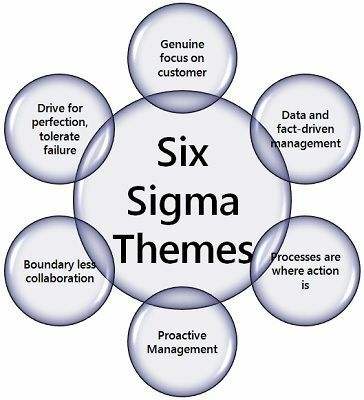 Theme 3 – Processes are where the action is: Six Sigma is a process-oriented technique, wherein the processes are seen as the major vehicle for the organization’s success. Theme 4 – Proactive Management: Proactive means, acting beforehand. Six Sigma involves those tools and techniques which are dynamic, responsive and proactive at the same time. Theme 5 – Boundaryless collaboration: It means to break the barriers and encourage teamwork within the organization. Theme 6 – Drive for perfection, tolerate failure: Six Sigma, strives for perfection, for which failures or mistakes should be tolerated. Six Sigma is just to make every unit or process of the organization capable of satisfying the changing demands of the customers, markets, as well as technology, along with benefitting the stakeholders.